After the success of the soup I posted last week —Butternut Squash & Vanilla Bean— (thank you everyone who messaged me on Instagram with photos of your soup!) I thought I would stick with the same flavor profile and create this simple side dish. I absolutely love how fragrant the butter turned out and when mixed with sweet winter squash and earthy sage this side dish is a total home run. Have fun here and feel free to roast some parsnips or sweet potatoes with your winter squash. This is a great recipe to whip up to accompany grilled steaks or roasted chicken. It’s even delicious in the morning for breakfast with a little granola sprinkled on top. I’m definitely going to start browning my butter with a vanilla bean pod more often. The flavor is deep, rich and delicious! I hope you all enjoy this easy winter recipe as much as we do. Grab a fork and dig in! In a small saucepan over medium-low heat combine the butter, vanilla seeds and pod and cook, stirring occasionally, until the butter is deeply browned and has a nutty aroma, about 5 minutes. Discard the vanilla pod. On a rimmed baking sheet drizzle the squash with the browned butter and sprinkle with a little salt and pepper. Toss well and roast in the oven until the squash is lightly browned and tender. About 30 minutes. Toss the squash halfway through cooking. Heat the olive oil in a medium sized skillet over medium heat. Add the sage leaves and fry for about 1 minute per side. Use a slotted spoon to transfer the sage leaves to a paper towel lined plate to drain. In a small dry skillet over medium heat add the walnuts and toast until golden brown, about 5 minutes. Shake the pan often and once cool enough to handle finely chop the walnuts. 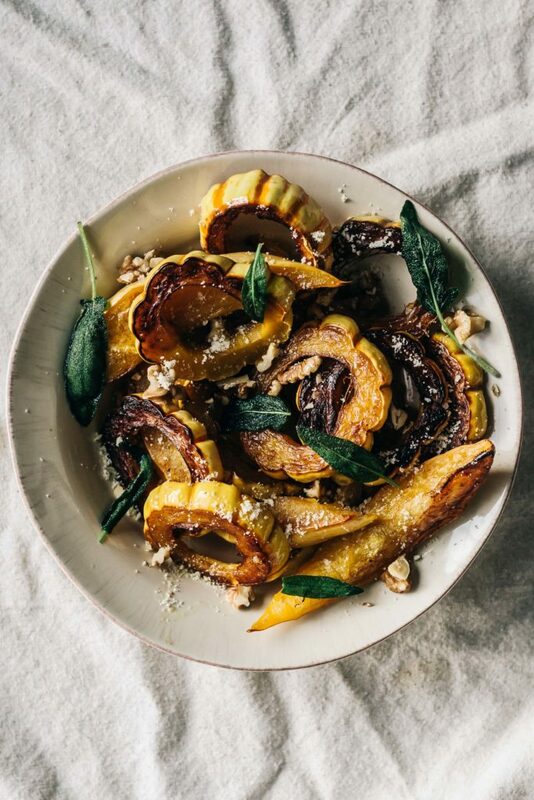 Serve the squash with the fried sage, toasted walnuts and drizzle with a touch of maple syrup if desired. Loved the recipe idea. I used vanilla extract instead since I used up my last pod and it worked just as well. I also kept using the same pan and added Chard stems, Broccolini and Carrots. Delicious! I did not have sage leaves and left out the walnuts only due to time. So happy you loved this too. I like your additions as well!